Michigan has a history of screwed up presidential primaries. In 1972, with Richard Nixon not facing a primary, Republican leaders encouraged Republicans to vote in the Democratic primary. They did, and George Wallace won. In 1988 Democrats held caucuses, and Jesse Jackson won. 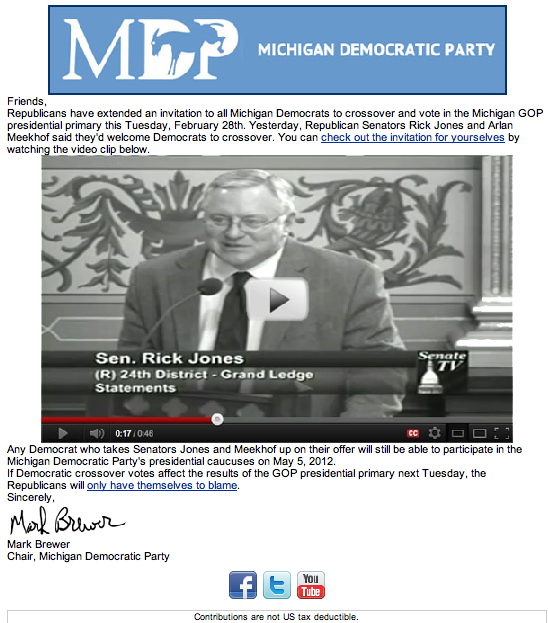 To this day many Michigan Democrats believe Jackson won with Republican votes. In 1996 Michigan Democrats shifted from a primary to a “firehouse caucus,” in which the Democratic party runs polling sites at schools, churches, fire stations and the like. It takes place on a Saturday, and voters have about 10 hours to show up at a voting site and cast their secret ballot. Michigan doesn’t have party registration, so there’s no way to do a closed primary, but Democrats require voters to sign a statement that for that day at least they declare themselves Democrats. Turnout is lower than it might otherwise be if it were a primary, but it’s much higher than at a regular caucus. The Republicans insisted on maintaining their taxpayer-funded primaries on a Tuesday. In 2000 this led to great hilarity. John Engler, the mean-spirited three-term Republican governor of Michigan, had publicly declared Michigan was George W Bush’s “firewall” state, and guaranteed a Bush win. That was too much for Democrats to resist. More to screw Engler than anything else, Democrats turned out in big enough numbers to shock Bush, humiliate Engler and give an upset victory to John McCain. Democrats stayed with the firehouse caucuses through 2004, but in 2008 then-governor Jennifer Granholm agreed to ditch the firehouse primary and go back to a standard primary that would take place in January. This, of course, was not sanctioned by the Democratic National Committee, and was a big cluster**** until the DNC rules and bylaws committee finally dealt with the delegate allocation in June, after Barack Obama had secured the nomination beyond what could be effected by the delegates from Michigan (and similarly rebellious Florida). Democrats decided to return to their firehouse caucuses for 2012. Republicans, however, both continued the taxpayer-funded standard primary, but through legislation also added a provision that voters would have to attest to being Republicans in order to participate. We may be looking at 2000 all over again. It even kinda makes me wish I was still a Michigan resident. And it’s probably causing a lot of worry at the Romney headquarters.